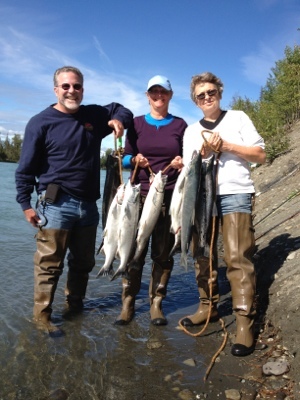 Fishing for sockeye salmon in the Kenai river can be a lot of fun. Today’s group found a limit of fish with ease. Once you are dialed in on the techniques and get the feel for fishing for sockeye salmon they can be easy to catch. These fish are hard fight, very acrobatic and can flat out destroy gear. Once you have landed the fish you are allowed to keep 6 per person right now or release it depending what you want to do. This group decided to only keep what they though they could eat over the winter. 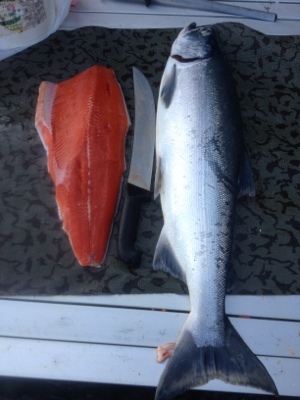 Sockeye salmon are tasty anyway you decide to cook them and I promise there will be no color added to the fillet! Chrome bright sockeye salmon are best for taking home. If you catch a fish that has been in the river to long I will recommend that you release it and try to catch a fresher fish. The best part of guided sockeye salmon fishing is being able to get to productive gravel bars and away from the mass crowds. Sockeye salmon fishing is very popular and you might have to share a gravel bar but I will do my best to keep you out of a combat fishing zone.